Julien Peyras is an incredibly talented winemaker working in the Languedoc near the village of Paulhan which lies just a short drive north-east of Beziers. All of his wines are equally delicious, however a couple of his offerings really caught our attention. 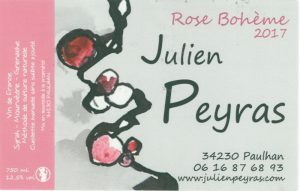 First, he is a master of rose and his Rose Bohême is one of the freshest and most delicious we have ever tasted.Then we tried his delicious aged white wine made from Clairette, Grenache Blanc and Roussanne and we were equally impressed.And finally when we tried his Gourmandise made from Cinsault which was picked from vines that are over forty years old and came to the conclusion that we liked everything he makes.His vines are planted on terraces that are strewn with rocks and clay from the Villefranchian epoch which was the most recent epoch of the Tertiary period, just before the start of the Quaternary period. And there is an added bonus of zero added sulphur! Julien is a member of the small, but very active and dedicated, S.A.I.N.S. group that are committed to using no sulphur at all during the winemaking process. He is also a member of the Association des Vins Naturels. This deep pink, delicious rosé is comprised of 40%Grenache and 60% Mourvedre two of the most popular reds grapes used in the Languedoc. The age of the Grenache is 35 years and the Mourvedre is slightly younger at 30 years. The yield from the vines is quite low at 30 hectolitres per hectare, but this means that there is more flavour concentrated in the grapes. The skins were macerated for about 12 hours to extract the juice to a medium pink colour. The result is a juicy, deeply-flavoured and enticing rose of considerable charm. The rosé has been produced using the saignée method which means bleeding off some of the juice from a tank of wine that keeps macerating to produce a red wine. The wine has been neither filtered nor fined and was bottled by gravity. L’Inattendu is aptly called ‘the unexpected’ because it is a complex assemblage of the juice from three different grape varieties that have all been treated in a different way. The main actor in this exciting drama is one of our favourite southern grapes, Clairette which comprises 50% of the blend. This grape is capable of delivering great wines in the hands of a skilled winemaker and that is definitely the case here. The skins of the Clairette were macerated for two weeks – we think a perfect amount of time to extract the anthocyanins from the skin of the grapes to give a lovely, light orange hue to the wine, but not too long which leads to the extraction of harsh tannins. At the same time Roussanne and Grenache Blanc were directly pressed and started fermenting in old barrels. When the maceration of the Clairette was completed the juice from the Roussanne and the Grenache Blanc was transferred to the must of the Clairette and the Clairette was transferred to the old barrel! This has produced an exceptionally complex orange wine that has no harsh overtones and still has vibrant fresh fruit flavour. This is an intriguing wine which can be drunk as an aperitif or as an accompaniment to food. 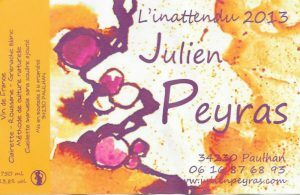 We have received stocks of a special white wine that Julien has crafted from Clairette, Grenache Blanc and Roussanne. The Clairette provides elegance and length, the Grenache Blanc provides structure and the Roussanne contributes its characteristic full-bodied fruitiness. All of the grapes come from small parcels near the village of Villefranche where the soils are limestone mixed with white and pink quartz. This is an amazing wine where the minerality shines through and the quality of the wine is marked by the long, lingering and delicious finish. The Gourmandise is comprised of 100% Cinsault (a variety found throughout the Southern Rhone and the Languedoc) from 40 year old vines which have been raised on clay and limestone soils then made into an easy-drinking wine. We are particularly impressed with this release! It took a while to settle but it is in a very good place now. The grapes were picked by hand, as all of Julien’s grapes are, and then carefully sorted before undergoing natural fermentation in stainless steel tanks. This is a fresh, lively, juicy, young red which really shows what this grape variety can demonstrate when in the hands of a good winemaker. Séraphin is an intensely flavoured red wine made from 100% Grenache. 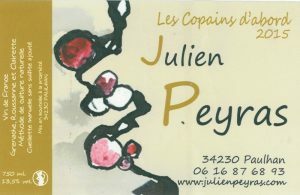 The forty year old vines grow in quartz and limestone clay and Julien treats the vines using biodynamic techniques including nettle and fenugreek sprays. The grapes ripened well in the warm 2017 summer. The grapes were picked by hand and then completely destemmed before being macerated for 2 weeks to extract the colour from the skins. The wine was fermented naturally and then transferred to three year old 400 litre barrels where it matures for 6 months. Very little of this wine is produced so we are lucky to have our small allocation. We recommend that you decant this wine before drinking. Note that you can pour it into a jug and then back into the bottle if you like! The Lo Tarral, which is the Occitan name of the local north wind that blows down from the hinterland mountains behind Montpellier is made from the trinity favoured in this area, namely Grenache, Carignan and Syrah. The yield for the Syrah is a low 30 hectolitres per hectare and for the Carignan and Grenache is a miniscule 15 hectolitres per hectare thus producing a wine of intense concentration. These grapes are vinified separately in stainless steel containers with pigeage (punch down) occurring daily. The wines are then matured in separate containers. They are blended together just before bottling. This is a delicious, earthy and interesting red wine with strength and wonderful heady aromas.